As we speculated at the end of the article below, Sony have removed all of their GTA V pages. Most likely because Rockstar Games haven't officially confirmed GTA 5's release platforms and may have requested the pages are taken down. Once we hear something official from Rockstar, you'll find out here. Thanks wilsongrout for the heads up! In somewhat of a shock move, the official UK Playstation website has created a page for Grand Theft Auto V, almost certainly confirming the game will be available on it's Playstation 3 console - credit to Disco-Lee for the find. While this isn't exactly surprising news - after all, we all expected the game to be launched on the PS3 anyway - the fact the official website has created a page for the game means they know for certain it's being developed for their console. Now we know all PS3 games come on Blu-ray discs, so that's nothing new. GTA is an action/adventure game, again standard info. It will most likely feature a 'single' player story mode, so that could be correct but Rockstar Games have already confirmed the game will feature Multiplayer, so the network play information is already wrong. The game has also been awarded an 18 rating already, which given that it hasn't yet been rated by PEGI, doesn't seem accurate (although would be expected). Regardless, this does pretty much confirm GTA 5 is coming to PS3 at some point. We currently have no news on the XBox 360 version, so don't start getting into a console war just yet! And TreeFitty has also pointed out this website is only available on the UK version of the Playstation website, not the US version. It's likely it was put up by mistake, but we got the screenshot above just as proof if the website is taken down again. The game is also listed on the Australian website among others as well. The pages have been removed. Okay There Will be No New Console's Because Of the Wii U So it shows that people Dont know things because If you didnt Know Microsoft Said " There Is No New Console coming this Year because PlayStation and Microsoft Because it's the Nintendo's Time to Shine" So people It might come this Year but Its not going on the New Console. Actually, there has been much speculation of which console the game will release on since we are still without a release date (could be in 2013 by now) and rumors of new consoles have been circulating for quite sometime. Sorry if this website is beyond your thinking power. Always when we say something... haha. the page has gone! We are unable to locate the page requested. If you think this is a broken link, you can report the error by visiting the Contact Us page. Otherwise, try returning to the Home Page or using Search to continue browsing eu.playstation.com. Thanks 'bab'. The news is still the same I suppose though. They definitely know it's coming out for PS3. No clue how reliable this site is...I'm guessing that their assuming but Zavvi has pre order for PS3 and Xbox 360. Personally I think it would be a stupid business move to not have it on both (as long as Xbox can even handle it) I want them to make as much $$ as possible so they can keep spending as much as they can making these games great. 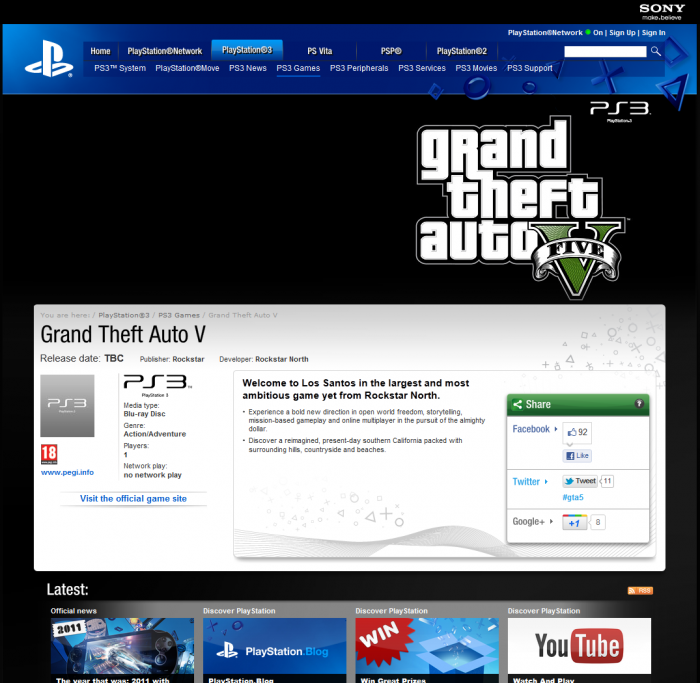 Official Playstation Website Confirms GTA 5 On PS3 - The official Playstation website has put up a page for Grand Theft Auto V, more or less confirming the game will be out on it's Playstation 3 console.